International Standards For Phytosanitary Measures No. 15 (ISPM 15) is an International Phytosanitary Measure developed by the International Plant Protection Convention (IPPC) that directly addresses the need to treat wood materials of a thickness greater than 6mm, used to ship products between countries. Its main purpose is to prevent the international transport and spread of disease and insects that could negatively affect plants or ecosystems. 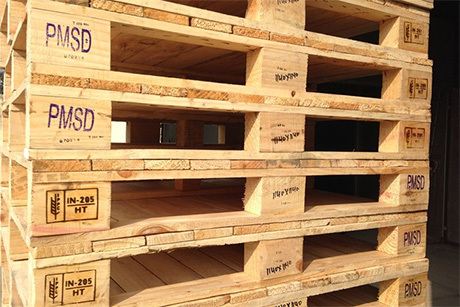 ISPM 15 affects all wood packaging material (pallets, crates, dunnages, etc.) requiring that they be debarked and then heat treated or fumigated with methyl bromide and stamped or branded, with a mark of compliance. This mark of compliance is colloquially known as the "wheat stamp". Products exempt from the ISPM 15 are made from an alternative material, like paper, plastic or wood panel products (i.e. OSB, hardboard, and plywood).